Note: This is my interpretation of Favorite Place, this week’s WordPress Photo Challenge theme. The idea is to share a photo of our “happy place” or a spot we love returning to over and over again. 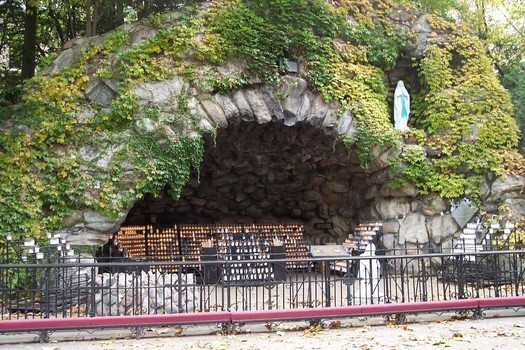 Officially called the Grotto of Our Lady of Lourdes, this shrine at the University of Notre Dame is one-seventh the size of its French counterpart. I took this shot when my son was a freshman there, and I never failed to visit it when I came to campus thereafter. I’m told it’s the site of many a marriage proposal, an urgent prayer for help on exams, and daily Rosary. This entry was posted in Photo Challenge and tagged favorite place, Grotto at Notre Dame, Haiku, wp Photo Challenge. Bookmark the permalink. Aw. You have featured one of my most favorite places. I owe a C in Statistics to several candles and prayers. Yes, I said a C. I was happy to get that. All A’s and a C. Close enough. Thanks, Debbie. I loved to go there. Yes, except on home football weekends, when the crowds are massive! Though I have to give them credit — even the visitors seem awed by the sight and immediately drop their voices, remove hats, and whip out cameras! How lovely. And when you left Domer the Freshman I bet you found reassurance and peace when you lit that candle and each time thereafter. He was in good hands. Spoken as only a parent could, Kb! Yes, I knew the Domer was in good hands. As you know, ND has a LOT of sacred places, from the chapels in every dorm to the Basilica. Perhaps some of the other places — a solitary bench, a walking trail around the lake, even just beneath the spreading branches of a huge tree — offer their own comfort. Oh Debbie….what a beautiful favorite place! You can actually “feel” the peace and sacredness just from your photograph. What a lovely spot! I felt that way when I spent the summer in Japan and visited the sacred temples in Kyoto. Just being there felt transforming to me, even though I am not a Buddhist, or even Japanese. Even so, it was a place that touched my soul and moved me to tears. Thanks so much for sharing, my friend! Have a great rest of your week! I’m glad the peace and sacredness of the Grotto came through in my photo, Ron. You’re a dear for saying so! I imagine I’d like to visit Japan, too. The cherry trees in D.C. — when not stunted by a surprise snowstorm! — are another place I’d love to see. Our world is chock full of beauty, isn’t it? And how fortunate we are that others have been able to capture some of its uniqueness through architecture and incorporating natural elements. Enjoy your snow, my friend! It looks to be a beautiful, calming place. I like it very much. Thanks, Lucy, it really is. It’s especially beautiful to see in the changing seasons, from Spring’s profusion of flowers to Autumn’s colorful reds and golds to the hush of a winter snow! What a lovely place. No wonder you enjoy and appreciate being able to return there from time to time. There truly is sacred space in the world, and not all of it is in churches. Our Lady of Lourdes, I will be right there with you praying with St. Bernadette. Thank you! And I appreciate your stopping by here! What a lovely place! I can see why it would be a favorite. It truly is! Glad you found it lovely, Dawn. Lovely place. Have you ever been to Lourdes? I haven’t, Pat, but I’d sure like to visit there. They say the ND grotto is a fraction of the size of the one in France, which must be HUGE! Great place to pray and meditate. My favorite place is my bed….but sometimes I fall asleep if I’m tired LOL. But many times since I live close to the water living on Long Island I like to sit in my car right by water and meditate. Ok… one more place ( and I do it a lot) is get my Starbucks and park and pray. Coffee time with God. It’s sooooo good that we can talk to God whenever we want 24/7. He’s so accessible! Absolutely! Wouldn’t you just hate having to set up an appointment with Him? !